Skin Titan was pleased to provide free skincare regimen sets to St. Joseph the Worker to benefit 227 homeless and economically-deprived employment seekers. Building that core of reassurance is so important. We hope our skincare will provide just a little extra icing on the cake to help these amazing individuals look good and feel good. To ultimately make that great first impression during their interview. For over 28 years, St. Joseph the Worker has been providing individuals in the Phoenix area with the tools, support and reassurance to secure quality employment and become self-sufficient. Achieved through one-on-one support, computer and internet access, professional clothing, resume development, mock interviews, financial coaching, certification and licensure fees, tools, safety equipment, and transportation needed to obtain and sustain employment, they successfully provide individuals with a needed hand up. Last fiscal year alone, St. Joseph the Worker helped 3,423 individuals secure employment with an average starting pay of $9.76/hour and 52% offering benefits. The skincare regimen sets supplied to St. Joseph the Worker include an estimated 2-week supply of their Day Cream, Eye Cream and Night Serum. This simple full-circle regimen improves the look of fine lines and wrinkles, eye puffiness and dark circles, pores and acne, and overall tone and balance. They also aid in collagen synthesis, reduce free-radical pollutant damage, balance oil production to combat either dryness or oiliness, nourish and hydrate, and promote healthy skin. Formulated with sensitivity in mind, the products include pure natural botanicals and custom bio-identical vegan proteins. The main or “active” ingredients between the products include hyaluronic acid, seakelp bioferment, marine collagen peptides, vitamin A, epidermal growth factor, and sodium pca. All are sulfate- and phthalate-free, and never tested on animals. And all of the skincare is made in the USA. Skin Titan is a boutique luxury skincare company offering a very simple regimen in only 3 products: Day Cream, Eye Cream and Night Serum. Collectively the products address the most common skin issues. 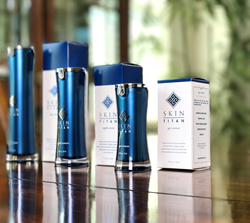 Customers all over the US have enjoyed Skin Titan products, as well as globally as far as Dubai, Sydney and Dublin. Skin Titan products are available online at SkinTitan.com.